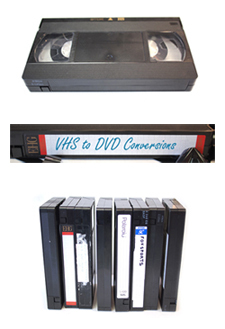 Get your VHS tapes transferred to DVD disc, file or Hard drive Today! VHS was invented in 1973, there was a bitter struggle between it and Beta during the Video Tape Format War but VHS was the victor in 1986. There won't be many people out there that didn't have a VCR and if any of you are anything like me you'll have a lot of old VHS tapes in a box somewhere, filled with family memories. Wouldn't it be good to see those faces again. Now you might be thinking "My VCR works fine, I don't need them put onto DVD" but don't think for a second that you are in the clear, did you know that every time you watch a tape you wear down some of the magnetic coating? They're only good for 50 or so viewings. VHS tapes are also quite sensitive to magnetism and some types of mould think they are delicious! You also might be thinking "I could do this myself" you are right, you could spend hundreds of dollars on buying the equipment, but you're also going to need a fairly grunty computer and hundreds of gigabytes of storage space to get it done. And don't forget the expensive software. That's also not including your precious time! 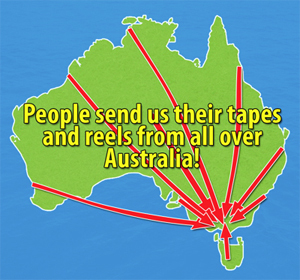 There is something that we do to your tapes that other places wont, apart from treat them like they’re our own. We will clean your VHS or VHS-C tapes. Remember when you hired a tape from the video store and sometimes, no matter how much you adjusted the tracking the picture still had lines through it and static? Cleaning often resolves this issue. Our VHS and VHS-C film transfers include proffessional tape cleaning for every single tape. This means that all of the dust and grime which may have built up on your tapes is removed and usually acheives a far superior transfer. Other transfer business may clean their machines after 30 tapes so the poor old 30th tape will often be of low quality. Here at PHOTOQ we transfer your clean tape in our very clean, high qualtiy machines and consistently achieve superior results to that of our peers. Sorry, I didn't mean to scare you but your VHS tapes won't last forever. So don't risk losing your precious memories! We don't just transfer VHS tapes to DVD disk, file or Hard drive. We also transfer VHS-C, S-VHS, Beta, Hi8, Digital8, MiniDV and Umatic tapes to DVD disk, hard drive or file. We can also transfer your old 8mm and 16mm reels and 35mm slides and negatives. Why not just bring or post them to PhotoQ and let us do them for you? Ring us on 03 9855 0006 to get a quote.